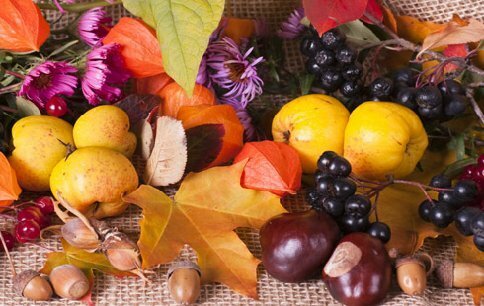 Fall is a great season to create craft decorations with natural elements. It can be fun to create natural craft decorations as a family, and bring the feeling of fall indoors. Popular items that might be used for fall decor are pumpkins, gourds, corn, fall leaves, branches, pine cones, and fall flowers. It can be a fun and easy project that lets you decorate for fall without spending much money. A branch centerpiece is a great way to bring the outdoors in with fun fall craft decorations. You can make your table emulate the feelings of fall with some branches and autumn leaves. First, collect some relatively straight branches that are adorned with brightly colored fall leaves. Depending on the desired size of your centerpiece, you can gather a few short branches or a larger number of longer branches. Once you’ve gathered your branches, wrap them in grape vines to create an even bundle. Place the bundle of branches in a simple glass vase and place it in the center of your dining room table. Craft decorations like this can also be used to decorate the fireplace if you use taller branches. Another great project to make your home feel like fall is autumn baskets. With a simple basket, you can create craft decorations to scatter throughout your home. Simply find several baskets and line them will fall leaves. Then, add pine cones, gourds, apples or other natural elements found in your yard. You might even choose to enhance these craft decorations with candles for added warmth.